The Grizzlies take an early lead and don’t look back as they hold the potent Foothillers to only three hits on the day. 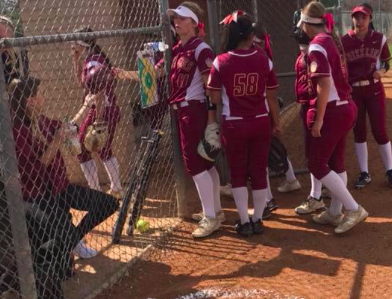 Mission Hills took an early 2-0 lead in the bottom of the first inning but Grossmont would get the run back in the top of the third inning when Kati Contreras (1-2, R, RBI, HR) blasted a solo home run to make it 2-1. Unfortunately for the Hillers the Grizzlies bats again came alive in the bottom of the third inning with multiple hits including a double by Catie Villalobos to break the game open 6-1. Mission Hills would tack on five more runs in the bottom of the fifth to round out their scoring. In the loss Samaria Roope went three innings, allowing 6 runs on 7 hits while striking out 6. The other Foothillers to get hits on the day included Brianna Blue and Jessica Medlin.